The bombing of Mortsel resulted in 936 casualties. April 5th, 1943. It was a Monday in Mortsel, a community south of Antwerp. All the witnesses remember that they were enjoying the first sunny day of spring. Children sat on their benches in school, or were doing gymnastics in the schoolyard. Some classes were on a walk to the woods in the neighboring village of Edegem. Their parents were working in one of the many factories. Others stood in line for their ration coupons, worked in their gardens, were waiting for the tram or were visiting relatives. Despite the war, life seemed to go on peacefully that day. Few realized that the clear skies above Antwerp were ideal for a bombardment. Such bombardments were risky undertakings because the bombers were easy prey for the German air force pursuit planes and the anti aircraft. However, the clear skies seemed a good indicator for hitting a target efficiently. The Eighth American Bomber Command based in England, were given the assignment to bomb the Erla-factory in Mortsel to destroy it. There, in a former Belgian auto factory, the fearsome German Messerschmitt planes were repaired. Although many American-friendly civilians lived in the neighborhood of the target, the Americans planned the attack with the help of every suitable bomber at hand. Such an attack was actually unnecessary to destroy a relatively small target. Why the Americans did not choose to do a low flying precision bombardment is unclear. In total they sent 70 Flying fortresses and 25 Liberators in the direction of Antwerp, with a payload of 774 bombs weighing a total of 283 tons. It was their fiftieth mission, and something of an anniversary that inspired a high ranking officer to fly with them, which increased the pressure on the pilots. Just before one o’clock mid-day, the planes left their bases in the south of England. 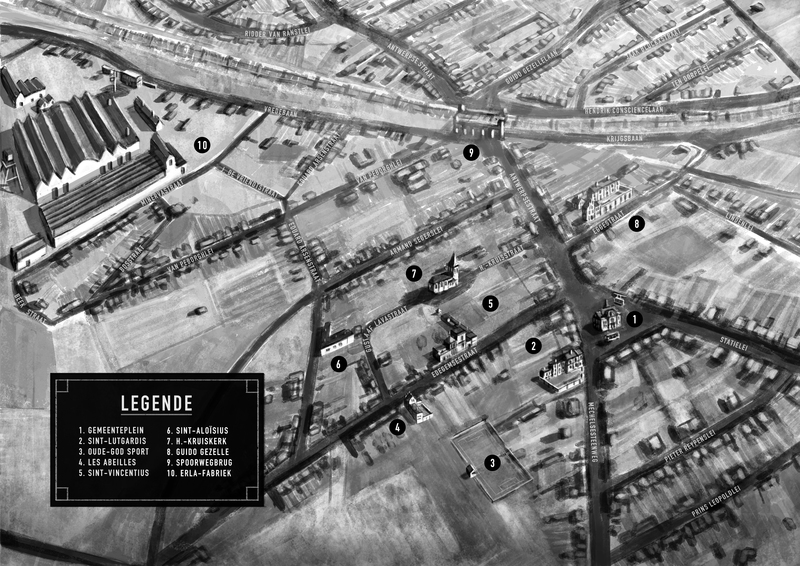 Around 3:30 in the afternoon the bombers appeared over Mortsel. Flying at an altitude of around 7000 meters (approx 25000 feet) the American bombers readied themselves to drop their deadly load. The squadron had been thinned to 82 bombers, because several airplanes had to return due to technical difficulties. The anti-aircraft which was located at the Erla factory and on Prins Baudewijnlaan was ineffectual because the planes were so high. The Flying Fortresses were the first to drop their bombs. A few minutes later, the rest of the planes flew over and continued the bombardment. This accounts for the pause between the first and second attack. 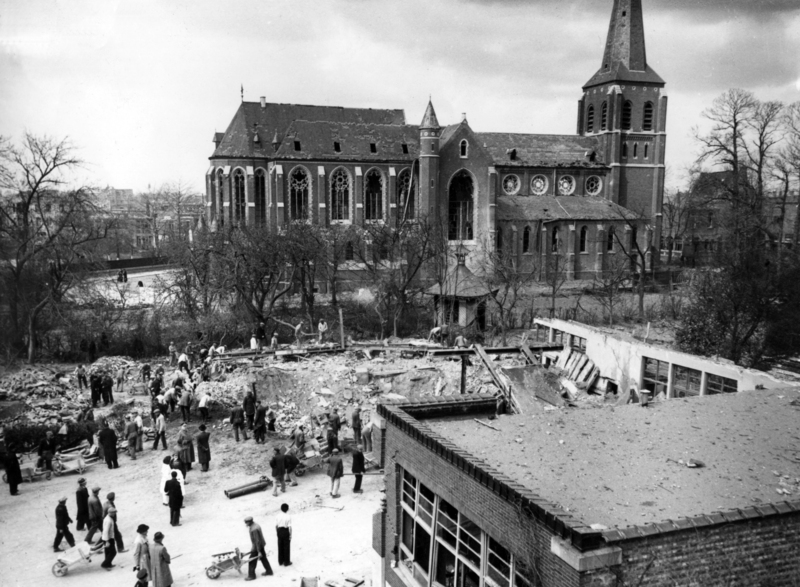 In total Mortsel was buried under 223 tons of explosives. Most of the bombs missed their target entirely and fell instead in the neighborhood known as Oude-God. Why then did things go so terribly wrong? Today we attribute such tragedies to “collateral damage”. The Americans flew too high, and with far too large a payload of bombs. The flight towards Antwerp was difficult in those days with the planes then in use. The heavy counter-attack by the German airplanes caused the planes to fly out of formation. The leaders could therefore not indicate the target in a straight line. A very few seconds at the height of 7000 meters was an essential time difference. The sightings that they used in those days were not so precise. We can actually postulate that the whole mission was a complete failure. It remains a riddle why the Americans did not decide to abort the mission. In the ensuing chaos only four of five bombs actually hit or came close to their intended target. Although the Erla factory sustained considerable damage and the lives of 307 laborers in the German workplace were lost, the factory resumed its work within a few weeks. The rest of the 600 bombs fell on the neighborhood of Oude-God, well east of the Erla. 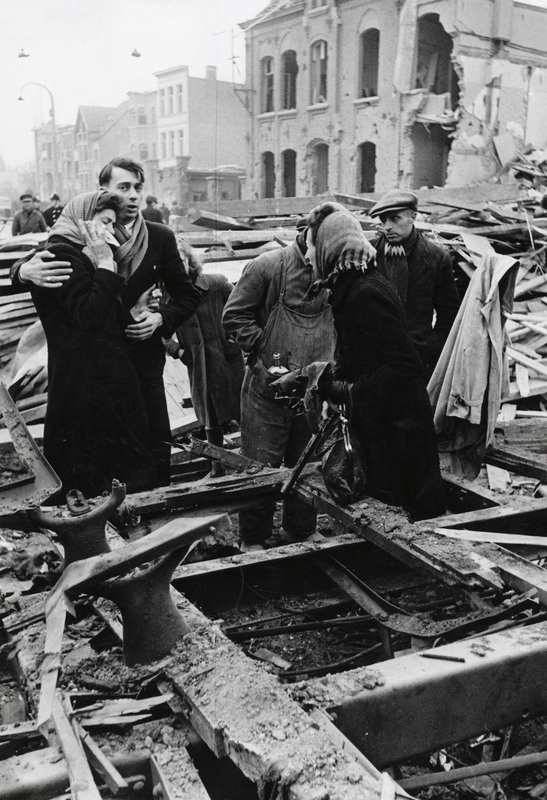 The children, workers and passers-by barely heard the air-raid sirens when the bombs began to fall. Four schools in Oude-God were heavily damaged. The whole front side of the Saint-Lutgardis School at the start of the Mechelse Steenweg caved in. 61 students and 5 nuns died under the rubble. A second school, Saint Vincent in the Edegem Street lost 103 students and 3 teachers in just a few minutes. Also, the smaller private school Les Abeilles, was hit. Two children were left dead on the street when a bomb fell close by. On the other side of the central community plaza, the Guido Gezelle boys’ school in the Eggestraat was also hit. Several bombs exploded nearby and one wall lost its support, burying and suffocating a large group of students. 23 boys died in those ruins. A whole generation of children in Mortsel was wiped out. Behind the St. Vincent’s school stood the Holy Cross church. One of the gables caved in. All the stained glass windows and furniture in the church were destroyed completely, and the main steeple was heavily damaged. The destruction in the streets of Oude-God was endless. All around the main square the streets were littered with dying people, burning cars, downed trolley lines and the large pieces of rubble that had once been part of the lordly mansions around the square. The Gevaert factory, north of Oude-God was also not spared, with 43 workers’ lives lost there. In total there were 936 dead. 107 of the bodies were unrecognizable when found. The other 829 were identified by relatives in the ensuing days. Nowhere in Benelux (Belgium, Netherlands and Luxemburg) were there so many victims from an aerial bombardment. Among the dead were 258 children under the age of eighteen. The official records show that there were 1342 wounded, many of them severely. 89 people were missing and never found. Those who died also included 110 in their homes, 199 in the open streets, 148 in the hospital. Of the 3700 homes in Mortsel, 3424 were destroyed or sustained heavy damage. The means of transportation were totally destroyed, and the rubble in the streets made them impassable for rescue vehicles.